BC High’s Michael Grant (21) celebrates his second-period goal, the second of his hat trick in Sunday’s 4-1 victory over No. 3 Pope Francis. in the 2nd period. 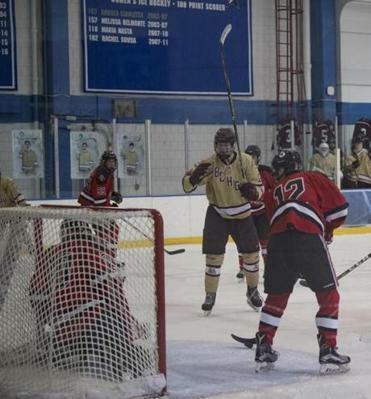 Entering the New Year, the BC High boys’ hockey team was sitting at 1-3-1, looking to stem its skid and return to the winning ways that have characterized the Eagles’ teams of recent memory. As the calendar flipped, so did a switch for BC High. Now, the Eagles have rattled off 11 straight wins, the latest a convincing 4-1 conquest of third-ranked Pope Francis on Sunday afternoon at UMass Boston’s Clark Center. The last time these two squads squared off was in a late December tie in the Pete Frates Winter Classic Consolation Game. In Sunday’s tilt, No. 2 BC High (12-3-1) stayed in control from the opening minute thanks to a hat trick from Michael Grant. On the first shot of the game, the Eagles jumped ahead early with a tally from the senior 26 seconds into the contest. After a botched clearing attempt by the Cardinals (11-2-3), Grant collected a pass from classmate Timmy Kelly in the high slot before snapping a shot past Pope Francis goalie Victor Larssen (20 saves). Grant helped reestablish a two-goal lead for BC High with 6:04 left in the second, slipping a shot past Larssen, short side, to make it 3-1. That tally came just a minute and 20 seconds after the Cardinals halved the original deficit on a Makem Demers slap shot on the power play. Much like the first period, an opening-minute strike in the third completed the hat trick for Grant, and provided the dagger for the Eagles. Fifteen seconds into the final frame, the senior forward put home a low-angle shot from the near side of the Pope Francis cage. Freshman Peter Kramer tallied the second goal for the Eagles at 4:37 of the first, slotting a shot into the top right corner on a two-on-one. On the other side of the rink, junior Luke Garrity made 18 saves in the win for BC High. Newton North 58, Brockton 40 — After ending Cambridge’s 53-game winning streak and handing Needham its first loss of the season, the Tigers (13-3) got a game-high 32 points from Princeton-bound guard Ethan Wright to add another statement game to its ledger by toppling the previously unbeaten Boxers (15-1) in Brockton. “We’ve shown the past couple weeks that we can play the best teams in the state and, when we’re at our best, we’re up there with any of them,” said Wright, who connected on 12 of 27 field goal attempts, including 4 of 6 from the foul line. After starting the year 1-2, North has won 12 of its last 13 games and provided a statement Sunday with a win over another D1 South contender. Southeastern 74, Randolph 53 — Keanu Intenque notched 24 points, 8 assists, and 3 steals to propel the Hawks. Globe correspondent Nate Weitzer reported from Brockton. For more highlights, go to bostonglobe.com/schools.